The start of the Race for the Conch open water swim competition. There are plenty of ways to stay fit while on vacation in Providenciales. Nearly all large resorts feature onsite fitness centres, and there are several gyms across the island which cater to locals and visitors alike. 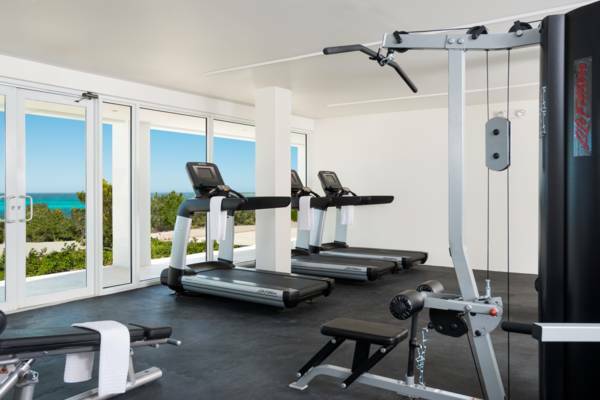 Many of the luxury vacation rentals have exercise equipment, and few of the more-expansive retreats have impressive and modern private fitness centres. A great element of the Turks and Caicos is that there are so many great outdoor activities to do, many of which are perfect for staying in shape. Largely due to the luxury tourism market, the Turks and Caicos also supports a strong yoga culture, and there are many boutique yoga and Pilate studios on Providenciales. 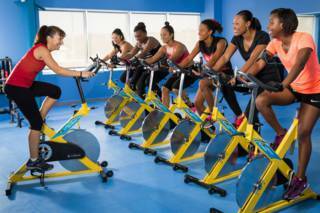 There are many fully-equipped fitness centres on Providenciales, with convenient locations across Grace Bay, Turtle Cove, central Leeward Highway, and Downtown. Nearly all locations offer short term access for visitors. The Graceway Sports Centre in central Providenciales is one of the larger fitness complexes in the country, and a gym, indoor basketball, squash, and volleyball courts, lit tennis courts, and football fields. Glow Fitness and Wrightfully Fit are two more popular local centres, with a wide range of classes and equipment. The Turks and Caicos is now home to its own CrossFit centre! IronShore Crossfit is located at Queens Landing plaza near the Graceway Gourmet supermarket in Grace Bay, and offers memberships and classes. Ironshore is a local term for a rugged and razor-sharp limestone terrain coastline found at some locations in the Turks and Caicos – a fitting name for the gym. 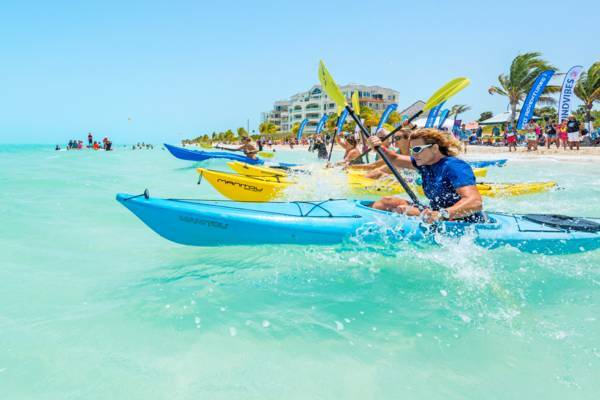 Kayak race at Long Bay Beach on Providenciales. One of the best aspects of fitness in the Turks and Caicos is the plethora of fun and exciting outdoor and water sport fitness activities. It’s simply easy to stay fit here. Stand up paddle boarding, or “SUPing”, is very popular and an excellent core workout. The Turks and Caicos offers amazing settings for this, from crystal clear shallows with sandy bottoms, to incredible and verdant mangrove wetlands and estuaries. There’s also great stand up paddle surfing at times, which can be a fun change from flat water paddling. On breezy days, SUP down-winders are great, as they add an exciting element to the open water distances. As the activity’s name suggests, paddlers start upwind, and navigate downwind to a different end location. It’s quite easy to do more than 5 miles (8km) on such a trip, and a great beach is often chosen as the end destination. During optimal conditions on paddle board downwinders, little wind waves can be caught and “surfed” for extra speed. Downwinders require a bit of transport organization, as paddling back to the starting point can be quite difficult on windy days, and downwind travel is only feasible. Transport by vehicle or boat back to the starting point is typically necessary. In the last few years, a strong open water swim movement has taken hold on Providenciales, and several organized training and competition events take place every year. There’s now a dedicated swim zone on the eastern side of Grace Bay Beach near Ricky’s Restaurant and Ocean Club Resort. This area offers a .25 mile (.4km) section that’s off limits to boat traffic. Long distance running is also taking off, and local and visitors can be seen training for events across the globe. The environment of the Turks and Caicos can be notoriously hot, which is perfect for marathon and triathlon training! The Turks and Caicos unfortunately lacks dedicated nature and hiking trails, yet there is the Bird Rock Point trail on Providenciales and the scenic and remote Crossing Place Trail on Middle Caicos. Coastal regions are the favoured hiking settings in the Turks and Caicos, and there’s certainly an amazing collection to discover! Road cycling is another popular sport. The Turks and Caicos Cycling Federation organizes training and competition events regularly. Several of the dedicated cyclists on Providenciales travel over to North Caicos on the ferry for a day trip occasionally, to take advantage of the open roads, lack of traffic, and new sights. Road and triathlon bikes are available for rent at local cycle shops on in Grace Bay, so you won’t have to endure the clunky beach cruiser when exploring the Turks and Caicos! Several organized team sports are played in the Turks and Caicos, and visiting guests are often welcome. There’s football (soccer), rugby, volleyball, and cricket. The Turks and Caicos does not have any large stores dedicated to sporting goods and equipment, yet a decent selection can be found with visits to a few shops. The expansive Do It Center shop carries a wide range of entry-level sports equipment. The shop at the Graceway Sports Centre is another good option. The Pro Shop at the Provo Golf Club offers the best selection of tennis and golf supplies. Glow Fitness provides a range of private and semi-private training, from strength training, cardio equipment, TRX and more. Personal training, group fitness classes, yoga (including thai yoga bodywork) are all offered. 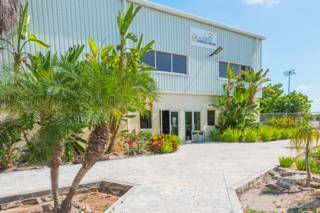 Sessions can take place at your villa, in our one-on-one studio, and also at the Graceway Sports Centre or Wrightfully Fit Fitness Centre in the heart of Grace Bay. FIT is based at the Graceway Sports Centre and specializes in personal training and running classes. FIT is a versatile company with some of the most reliable and portable fitness equipment on the island from kettlebells to TRX, boxing and boot camp equipment and much more. Personalized sessions are available on the beach, in private gyms or in the comfort of your own home. Graceway Sports center offers a gym, classes for fitness, dance and martial arts, and facilities for many different sports including tennis, basketball and squash. 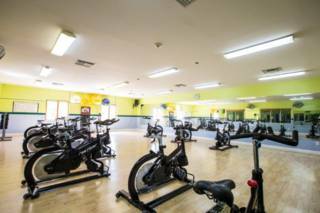 This fully equipped gym and fitness center is centrally located in Turtle Cove. Daily and weekly guest passes available.